NASA astronomers released stunning pictures of the newly discovered planet cluster TRAPPIST-1 Wednesday afternoon, providing a wondrous relief from Earthly news. The space agency published several illustrations of the solar system based on its projections of what the surfaces of the planets may look like, and the animations are so good they're almost as cool as the actual planets. This is a huge moment in space exploration, because these planets may be the Earth's closest neighbors with the potential to sustain life. This discovery is actually building off of one from last year — in May 2016, NASA announced that it had discovered three planets to TRAPPIST-1, which is named after the machine that discovered them (The Transiting Planets and Planetesimals Small Telescope in Chile). Wednesday's announcement added four more planets to the system, all seven of which could potentially hold water. However, the cluster of planets is approximately 39 light years away from Earth, a little over 229 trillion miles. Humans don't yet have the technological capability to travel that far into space, so it could be quite some time before an Earthly representative can visit the planets in TRAPPIST-1. Even still, this is one of the most promising discoveries for life outside Earth in the history of human space exploration. Three of the seven planets are within the habitable zone for the system, the distance away from the central star that would make it possible to sustain life on the planet. Density analysis of the planets led researchers to believe they are similarly rocky to Earth's surface, which may also mean that they have liquid water that could sustain life. And although the system's sun is significantly smaller and colder than Earth's, NASA still believes the planets that are closer to the sun could host life. "This discovery could be a significant piece in the puzzle of finding habitable environments, places that are conducive to life," Thomas Zurbuchen, a NASA administrator, said for the press statement about the discovery. "Answering the question 'are we alone' is a top science priority and finding so many planets like these for the first time in the habitable zone is a remarkable step forward toward that goal." Thanks to digital animation, people can get an incredible glimpse of what the planets might look like. 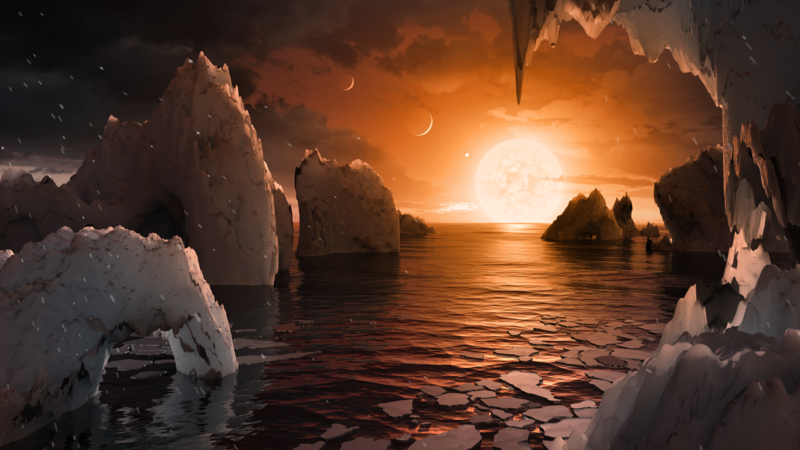 The YouTube video above features 360 degree view from the surface of one of the TRAPPIST-1 planets, as well as a view of the sky where the other six planets are visible in the dim light. In addition to the illustrations, the digital video (and possible virtual reality application) provide the world with inspirational insight into the possibilities of space. Space has long symbolized the potential to rise above the problems of Earth and humanity, a place to find peace and perspective. The greatest thing about space exploration in the 21st Century is that the dissemination of that information is now more accurate and equitable than ever. The photos themselves are part of an important shift in how people relate to space, as well as the actual discoveries.